Son of August and Charlotte Miedcke, who both worked for the Nationaltheater in Nuremberg. After his singing mother was transferred to Stuttgart in 1805 his father died and he was adopted by Johann Baptist Krebs and took his last name. He was musically educated by Johann Nepomuk Schelble and was able to play parts by Mozart and Ries when he was six years old. When he was 21 he went to Vienna to study composition with Ignaz von Seyfried. At that time he was a virtuoso at the piano and in 1826 he was appointed third musical director at the Hofoper. In 1827 he was engaged as musical director at the Stadttheater in Hamburg. Several opera's by his hand were stage succesfully and in 1850 he became musical director of the Court Theatre in Dresden. He held this position until 1871. After that he solely directed church music at the Katholische Hofkirche in Dresden. In 1850 he had married Aloyse Michalesi and their daughter Mary Krebs became a well known pianist. 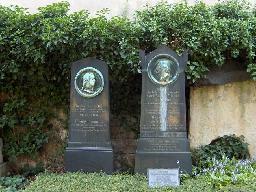 The grave of Mary Krebs-Brenning, Aloyse Krebs-Michalesi and Karl Miedke at the Alter Katholischer Friedhof, Dresden.